I’m still new to piano and just getting into key signatures. 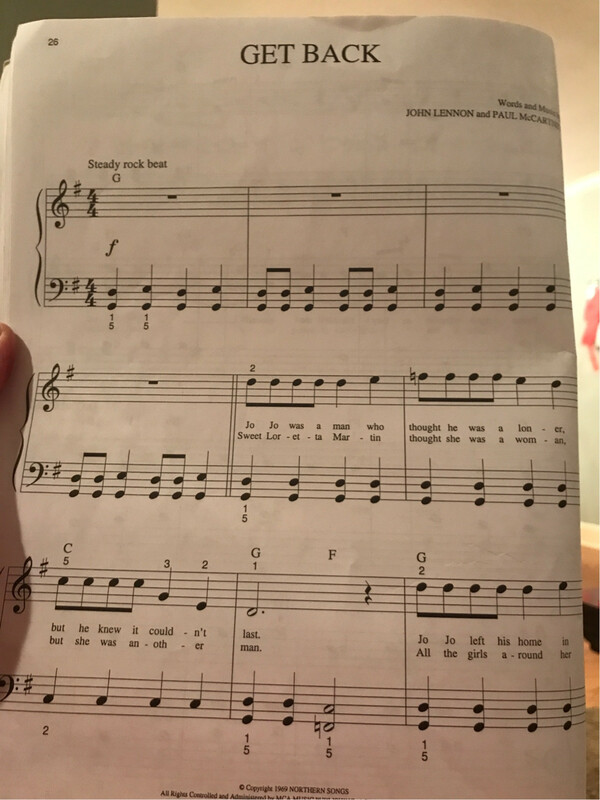 In Beatles’ Best (easy Beatles sheet music) Get Back is in G, however, all F’s have a natural accidental next to them. 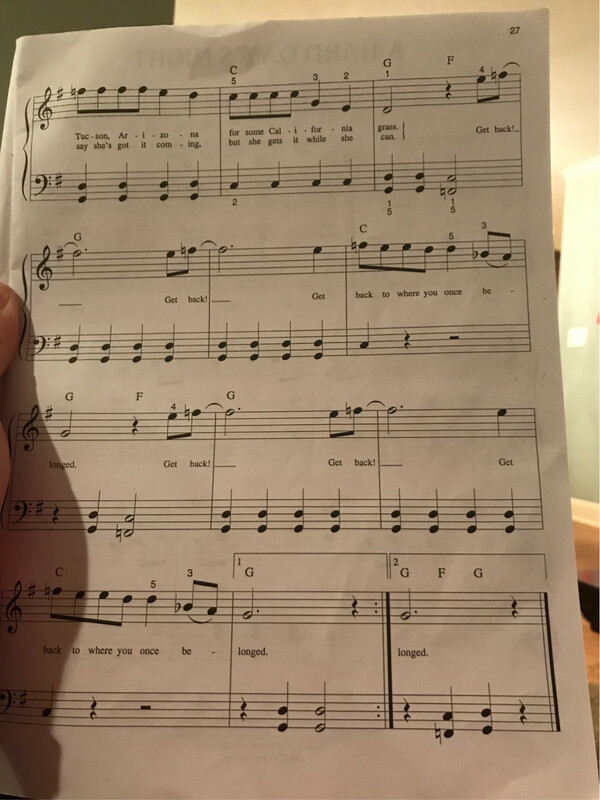 Is this sheet music over simplified and a more complex version would have F#’s? Do I need to be playing other notes differently? What am I missing? TL;DR a lot of rock/blues/jazz music uses the flat seventh in tunes that are otherwise major; including regular use of 7th chords (G7, C7, D7). The convention is to set the key signature to reflect the tonality (G major in this case) but put accidentals on all of the sevenths. This is an effect of the imperfect match between classical harmony and the conventions of the early blues music as practiced by African Americans from which sprang later blues, rock and jazz music. The tonic is G, and the harmony is centered on G major. However, the origins of blues/rock music aren't in the western harmonic tradition. Instead they tend to use the flattened seventh, mix major and minor thirds, and other blue notes, instead of being (more) strictly diatonic. This also affected the way they selected the harmonic accompaniment; dominant seventh chords are used in places/ways that are not regularly found in common practice harmonic music. For a long time, this music promulgated without being formally written down (or at least not written down in conventional staff notation). Eventually, people had to figure out a way to notate this music using conventional notation. The chords/harmony are primarily major, so the key signature reflects that, but then all of the of the sevenths (and other bluesy notes) need to be notated with accidentals. Somebody might be asking "Why not G mixolydian?" -- this has to do with the fact the Mixolydian implies more than just a set of notes, it implies melodic structures and conventions on how to make G the tonic with that set of notes. Blues influenced music does not match up with that aspect of modal music. A bit of Devil's advocate here - but this could have been written out in key C, as it could be construed that it feels at rest on C. Doing that would make all the Fs natural anyway. So, it could be starting on the V chord of C - G7. The Bb over a C bar would then be either blues orientated or C Mixolydian. As already stated, blues uses b3and b7 (and b5) a lot, so when written in G, the F#s would often need to be F nat. No, simple (but dumb) notation could have just written it without a key signature at all! It's blues-infulenced pop. The constant use of I7 - using the flattened rather than natural 7th of the scale as an extention of the tonic chord (F natural in a G chord) - is straight from the 12-bar blues. The extention of this idea into using a complete b7 chord (F) was a favourite of the American MOR composer Burt Bacharach, it may not be too fanciful to cite his infulence on the Beatles. Or, perhaps it was just that when playing full-barre chord shapes on guitar, it's so easy to shift the same shape up or down the fretboard and think 'that sounds good!' No 'theory' involved.